It’s Mother’s Day and there’s a myth that says there’s only one way to be a Mama. But Eve is called “the mother of all living” and I’m declaring all women are mamas because all women bring life to the world in some way. So here’s to you–the ones who bring life into this world with your words and your hearts, your hands and your minds, who encourage and create, who help us be better and stronger and braver. If you have a physical child, we celebrate you. If you don’t, we celebrate you. Let’s never allow our hearts to believe anything other than this: We all matter. We all make a difference. We all have much that’s good and beautiful to bring into this world. Happy Mother’s Day to all of us. I am hanging out alone and it’s a little hard, but thought about writing…for all those who must feel some pain on Mother’s Day. Not sure if you do or not, but there certainly are plenty if women who “couldn’t be Mom’s” , women who lost children, women who had great Mom’s, but they are gone now and then there are those, like me, that will always feel some pain on this day because of abortion. of 5, but only 3.
out a bit more , but I know that my God will carry me through and touch my heart, heal my wounds and show me ‘Grace Beyond Measure’ today, as He has come so many many times before. You are healed and forgiven–given beauty for ashes, wholeness for what you feel is lacking. because you’ve asked God. RECEIVE IT!! There’s no shame. No condemnation. Let HIS WORD RENEW you!! Grace abounds! Surrender your shame and receive relief. God has already forgiven you. He has made beauty out of ashes. It is the devil that wants you to feel pain. He is working overtime to put us in despair. God can & will heal your broken heart. Cry out to Him. He hears you & knows your every tear. No more condemnation. Tell the evil one that GOD IS IN CONTROL! Your are His beloved daughter. You might want to read Bonnie Gray’s book “Whispers of Rest” – a 40-day journey of soul care & resting in Him. It is a great book & has great ideas about caring for yourself! Happy Mothers day to ALL women out there. You are moms in your own special ways. We all give our time & energy to others. We encourage, teach, heal, run errands & do all the things moms do. Each one of you deserves a high five & a note of appreciation. I had the privilege yesterday of getting food for a friend’s family. Dad had a stroke a month ago & two weeks ago was in a logging accident where a tree fell on his left side. He & wife are raising grandchildren. We were doing a Feed the Multitude. There was food left over & I put together a big stack of food including a casserole. I know how it is to care for someone & then have to get food together for meals. Wanted them to see the love & light of Jesus! May your day be full of blessings! Amen, Holley! 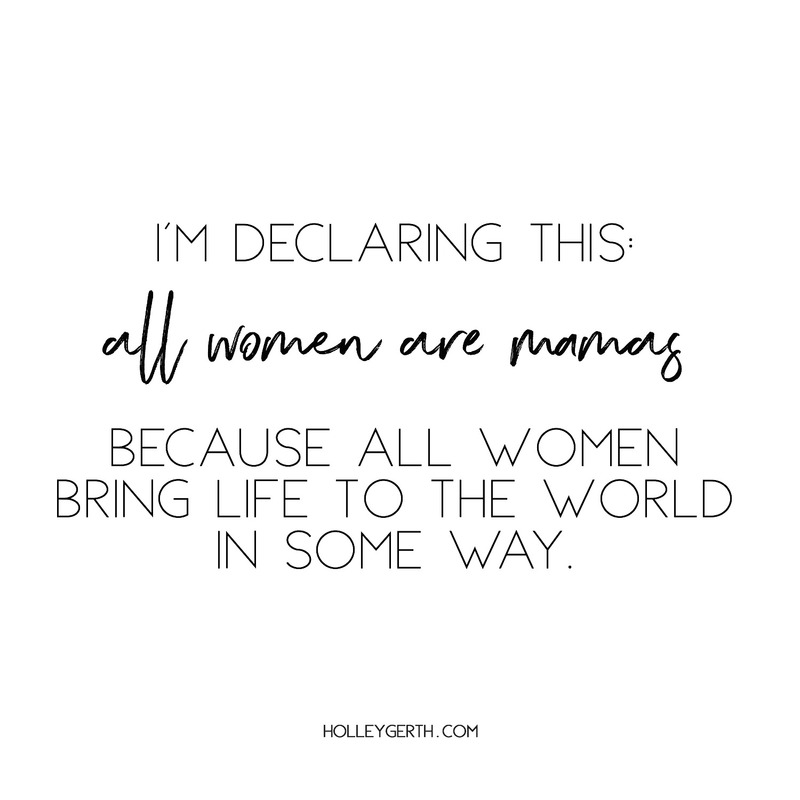 Let’s celebrate more than the title “mother;” let’s celebrate the effort, the self-sacrifice, and the perseverance of those who positively impact others LIKE mothers. You’re right: they bring MUCH good and beauty into the world and make it a better place!